"The three main features of depression, whether in children or adults, are feeling unlovable feeling that you are worthless and feeling as though you have no control over relation ships. -Dr. Kavin Stark"
It is very common illness at modern times, as we are becoming more and more busy and alone in over life, but it doesn't mean that it is not serious. It is a very serious illness. I personally experienced it when my brother suffer from this. I was also very tense during his illness. It needs a proper treatment. As i experienced it myself and know what going on with the family members of the person who suffers, i think why not this be a subject for me to write on. Depression is an illness, in the same way that diabetes or heart disease are illnesses. Depression is an illness that affects the entire body, not just the mind. 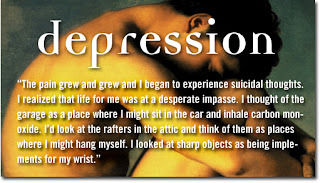 Depression is an illness that one in five people will suffer during their lifetime. Depression is the leading cause of alcoholism, drug abuse and other addictions. Depression is an illness that can be successfully treated in more than eighty percent of the people who have it. Depression is an equal-opportunity illness – it affects all ages, all races, all economic groups and both genders. Women, however, suffer from depression almost twice as much as men do. At least half of the people suffering from depression do not get proper treatment. Depression is not something to be ashamed of. Depression is not a character flaw or the sign of a weak personality. Depression is not fully recognized as an illness by most health care insurance providers. Most will only pay 50% of treatment costs for out-patient care, as well as limiting the number of visits. Lost of interest in daily activities. Low self esteem or feeling guilt. Sleep less then a normal person. Unhappy family and relation ship. Any unhappy incident happen in family. Such as the death of any family member. problem of the place where person works. Such as difficult work atmosphere. Start the treatment of a Doctor. Make the person and the atmosphere happy. Pursue him or her to join any meditation group, laughter club or start Yoga.